Function: Expels wind-heat, clears fire, brightens the eyes. Indications: Headaches, redness and pain of the eyes, failing vision, lacrimation, deviation of the eyes and mouth. Function: Removes obstructions from the channel, benefits the ears, expels exterior wind. Indications: Deafness, tinnitus, toothache, motor impairment of the temporomandibular joint, mumps, deviation of the eye and mouth. Function: Frees the channels and quickens the connecting vessels, boosts the hearing. Indications: Headache, deafness, tinnitus, diplacusis, deviation of the eye and mouth, toothache. Function: Courses wind, quickens connecting vessels, clears heat, settles fright, relieves pain. Indications: Migraine, vertigo, tinnitus, pain in the outer canthus, toothache, convulsion, epilepsy. Function: Courses wind and quickens the connecting vessels, disperses swelling, relieves pain. Indications: Migraine, pain in the outer canthus, facial swelling. Function: Removes obstructions from the channel, benefits the ear. Indications: Migraine, pain in the outer canthus, tinnitus, frequent sneezing. Function: Clears heat and disperses swelling, extinguishes wind and relieves pain. Indications: Headache, swelling of cheek, trismus, pain in temporal region, infantile convulsion. Function: Removes obstructions from the channel, benefits the ears. Indications: Migraine, vertigo, vomiting, infantile convulsion. Function: Removes obstructions from the channel, subdues rising Qi, eliminates interior wind, calms spasms, calms the mind. Indications: Headache, epilepsy, swelling and pin of the gums, convulsion. Function: Courses and disinhibits the Liver and Gallbladder, dissipates wind and frees the connecting vessels. Function: Clears heat and disinhibits Gallbladder channel damp-heat, frees the ears and disinhibits the throat. Indications: Pain in the head and neck, tinnitus, deafness, pain in the ears. Function: Eliminates wind, calms spasms, subdues rising Qi, calms the mind. Indications: Headache, insomnia, swelling of the cheek, retro-auricular pain, deviation of eye and mouth, toothache. Function: Calms the mind, eliminates wind, gathers essence to the head, clears the brain. Indications: Headache, insomnia, vertigo, epilepsy. Function: Eliminates exterior wind, subdues rising Qi. Indications: Headache in the frontal region, pain of the orbital ridge, eye pain, vertigo, twitching of the eyelids, ptosis of the eyelids, lacrimation. Function: Regulates the mind, balances the emotions, clears brain, brightens eyes, frees the nose. Indications: Headache, vertigo, lacrimation, pain in outer canthus, rhinorrhea, nasal obstruction, manic depression. Function: Courses the channels and connecting vessels, clears head and brightens eyes. Indications: Headache, vertigo, red and painful eyes, nasal obstruction. Function: Clears heat and drains the Gallbladder, soothes the sinews and quickens the connecting vessels. Function: Calms the mind, clears the brain, drains heat, diffuses Lungs, frees portals. Indications: Headache, vertigo, epistaxis, rhinorrhea, obsessive thoughts and dementia. Function: Clears the Gallbladder and drains fire, soothes the sinews and quickens the connecting vessels, rouses the brain and frees the portal. Indications: Headache, stiffness of the neck, vertigo, painful eyes, tinnitus, epilepsy. Function: Relaxes sinews, promotes lactation, promotes delivery. Indications: Pain and rigidity of the neck, pain in the shoulder and back, motor impairment of the arm, insufficient lactation, mastitis, scrofula, apoplexy, difficult labor. Function: Loosens the chest and normalizes Qi, soothes the sinews and quickens the connecting vessels. Indications: Fullness of the chest, swelling of the axillary region, pain in the hypochondriac region, pain and motor impairment of the arm. Function: Courses the Liver and rectifies Qi, calms dyspnea and downbears counterflow. Indications: Fullness of the chest, pain in the hypochondriac region, asthma. Function: Resolves damp-heat, promotes the function of the Gallbladder and Liver. Indications: Pain in hypochondriac region, vomiting, acid regurgitations, hiccups, jaundice, mastitis. Function: Used more for diagnosis than treatment of kidney problems. Indications: Abdominal distension, borborygmus, diarrhea, pain in lumbar and hypochondriac region. Function: Regulates the uterus, resolves damp-heat, regulates the Girdling Vessel. Indications: Irregular menstruation, amenorrhea, leukorrhea, abdominal pain, hernia, pain in the lumbar and hypochondriac region. Function: Strengthens the lumbar and boosts the Kidneys, courses the Liver and rectifies Qi, treats vaginal discharge. Indications: Leukorrhea, lower abdominal pain, lumbar pain, hernia, constipation. Function: Courses stagnant Qi, rectifies the intestines, leashes the Girdling Vessel. Indications: Leukorrhea, lower abdominal pain, hernia, prolapse of uterus. Function: Removes obstructions from the channel, tonifies Qi and blood, resolves damp-heat. Indications: Pain of the lumbar region and thigh, muscular atrophy of lower limbs, hemiplegia. Function: Expels wind, relaxes sinews, strengthens the bones, relieves itching. Indications: Pain and soreness in the thigh and lumbar region, paralysis of the lower limbs, beriberi, general pruritus (swelling of skin). Function: Soothes sinews, quickens the connecting vessels, expels wind and dissipates cold. Indications: Pain and soreness of the thigh and knee, numbness and weakness of the lower limbs, hemiplegia. Function: Dispels wind and dissipates cold, soothes the sinews, quickens the connecting vessels and relieves pain. Indications: Swelling and pain of knee, contracture of tendons in popliteal fossa, numbness of leg. Function: Promotes the smooth flow of Liver Qi, resolves damp-heat, removes obstructions from the channel, relaxes the sinews, subdues rebellious Qi. Indications: Hemiplegia, weakness, numbness and pain of the lower extremities, swelling and pain of the knee, beriberi, hypochondriac pain, bitter taste in the mouth, vomiting, jaundice, infantile convulsion. Function: Relaxes sinews, removes obstructions from the channel, stops pain. Indications: Fullness of chest and hypochondriac region, muscular atrophy, paralysis of leg. Function: Removes obstruction from the channel, stops pain. Indications: Pain in the neck, chest, thigh and hypochondriac region, chills and fever that accompany rabies. Function: Brightens the eyes, expels wind, clears heat, conducts fire downwards. Indications: Pain in the knee, muscular atrophy, motor impairment and pain of the lower extremities, blurring of vision, ophthalmalgia, night blindness, distending pain in the breast. Function: Subdues Liver yang, clears heat, resolves damp-heat. Indications: Migraine, pain of the outer canthus, pain in the axillary region, scrofula, lumbar pain, pain in the chest, pain in the hypochondriac region and lateral aspect of the lower extremities, malaria. Function: Benefits essence, nourishes marrow, eliminates wind, strengthens sinews and bones, clears and cools damp-heat, benefits Liver and Gallbladder. Indications: Apoplexy, hemiplegia, pain in neck, abdominal distension, pain in hypochondriac region, muscular atrophy of the lower limbs, spastic pain of the leg, beriberi. Function: Promotes the smooth flow of Liver Qi. Indications: Pain in the neck, swelling in the axillary region, pain in the hypochondriac region, vomiting, acid regurgitation, muscular atrophy of the lower limbs, malaria, pain and swelling of the external malleolus. Function: Resolves damp-heat, promotes the smooth flow of Liver Qi, regulates the Girdling Vessel. Indications: Headache, vertigo, pain of the outer canthus, scrofula, pain in hypochondriac region, distending pain of the breast, irregular menstruation, pain and swelling of the dorsum of the foot and toe. Function: Clears the Liver and drains the Gallbladder, brightens the eyes and sharpens hearing. Indications: Pain of the canthus, tinnitus, distending pain of the breast, swelling and pain of the dorsum of foot. Function: Subdues Liver yang, benefits the ears, resolves damp-heat. Indications: Headache, dizziness, vertigo, pain in outer canthus, tinnitus, deafness, swelling of the cheek, pain in hypochondriac region, distending pain of the breast, febrile diseases. Function: Subdues Liver yang, benefits the eyes, calms the mind. Indications: Migraine, deafness, tinnitus, ophthalmalgia, dream-disturbed sleep, febrile diseases. Treating headaches, especially ones near the temple or side of the head. Removing phlegm disorders and disorders related to swelling caused by retention of bodily fluids, such as swollen lymph nodes. Clearing energy disruptions of the Gallbladder channel which are the cause of jaundice, pain in the side of the torso, nausea, or fever. Treating emotional disorders believed to be related to the wellbeing of the human soul. ​Healing atrophy of the leg muscles. The Gallbladder meridian travels from the toes all the way up to the top of the head. 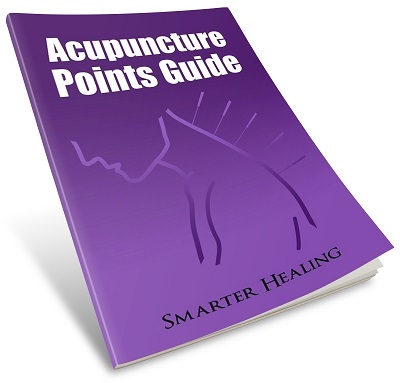 Alongside the primary meridian channel that features the acupuncture points, there are also secondary energy pathways through which the energy of the Gallbladder meridian flow. ​The first energy pathway of the Gallbladder meridian is the Gallbladder luo-connecting vessel. This is one of the shortest secondary energy pathways of all the meridians. This line of energy separates from the main meridian line at acupoint GB3​7 on the lower calf/upper ankle portion of the leg. It travels down the leg alongside the primary meridian channel and then dispersers the energy of the Gallbladder onto the foot. Along its way, it also connects with the Liver meridian. The next pathway is the Gallbladder divergent channel. This line of energy diverges from the primary meridian channel on the thigh, not at a specific acupoint but near acupoints GB31 and GB32. It travels towards the pubic region where it connects with the Liver divergent channel. It then travels upwards inside the torso where it passes through the physical ​gallbladder and the physical ​liver. It continues upwards through the physical hear​t and esophagus until it reaches the throat and lower jaw. ​The pathway emerges onto the face on the lower jaw, then goes upwards to disperse its energy onto the side of the face. ​The divergent channel finally ends at acupoint GB1 where it re-connects to the primary meridian channel. The final area of energy is the Gallbladder sinew channel. The sinew channel is the area of tissue and muscle that is highly influenced by the energy of the Gallbladder meridian. 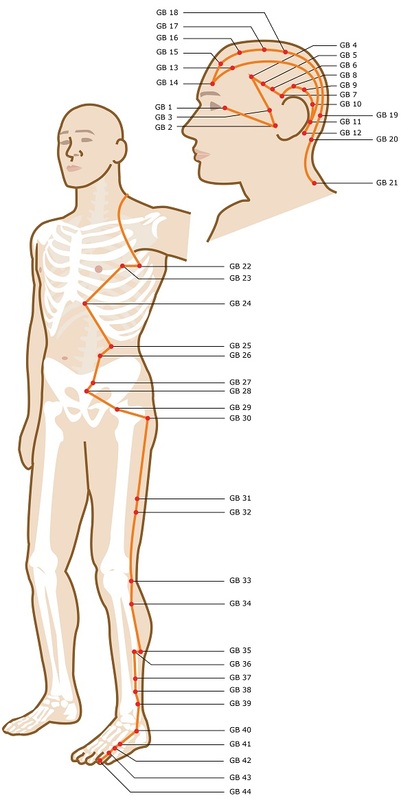 This tissue begins around acupoint GB1 on the second to smallest toe, and follows the primary meridian line up the leg. The sinews bind at the ankle joint and the front area of the knee, and continue rising along the upper leg. A branch of the sinew channel goes backwards near the waist and onto the upper buttocks, where it continues until it reaches the spine and binds at the tailbone area. The primary pathway continues up the body from the waist, and splits into two pathways which you can see on the image above. The two pathways then reconnect near acupoint ST12 of the Stomach meridian​​ above the collarbone area, where the sinews bind. On the head, you can see the complicated sinew pathway taken by two different branches that form. ​The main branch goes towards the top of the head, where it ends, whilst the secondary head branch travels down the face and binds at the side of the nose.